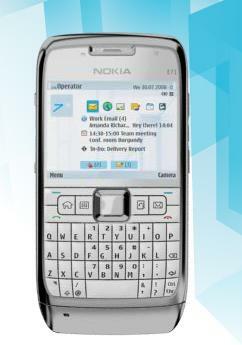 The slim and stylish Nokia E71 is famous among business user after it was launched in July 08. With a device of full QWERTY keyboard, it’s targeting business users who lead a mobile lifestyle. a) This phone supports email accounts from more than a thousand internet services such as Yahoo, Gmail and Hotmail. b) This phone also supports Nokia Intellisync Wireless Email solutions and also 3rd party email solutions. c) It comes with the new switch mode that allows people to switch between personal and work home screens. d) It comes with calendar entries and helps on business planning as well as Messages, Browser, Maps, Notes and File Manager.